Read my "Neff" review on: Amazon.com and Kindle. Assumptions can often be wrong. 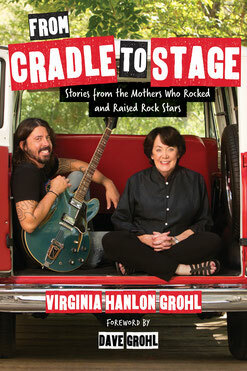 On the surface, you might assume “From Cradle To Stage" by Virginia Hanlon Grohl is just another Dave Grohl/Nirvana/Foo Fighters book. It is way more than that. More than a proud mother touting her son's accomplishments. This is a book that speaks to all those who have the passion to pursue dreams. The structure of the book is deceptively simple – the stories of seventeen musician/artists as seen through the eyes of their mothers. The backgrounds and personalities of the “rock moms” set the tone for each individual narrative. The musicians are a varied lot: Michael Stipe, Dr. Dre, Miranda Lambert, Mike D, Gary Clark, Jr., the Haim Sisters, Geddy Lee, Adam Levine, Kelly Clarkson, Pharrell Williams, Dave Matthews, Zac Brown, Warren Haynes, Amy Winehouse, Josh Groban, Adam Levin, and Tom Morello. These unique stories are interwoven with thirteen vignettes which relate Virginia's the personal experiences with her son David's journey. Insights into his early years with bands like Scream, the Nirvana years, his relationship with Kurt Cobain, up through the present day Foo Fighters are all parts of her own story. The result is a sort of quilt with each panel being different yet stitched together by threads of common experiences. For example, although coming from diverse backgrounds, they all shared the “Aha!” moment, a point in time when their child realized his/her path in life. “Music is a calling that doesn’t call softly or politely. It screams insistently. The musician WILL find a way,” observed Nancy Weinrib, Geddy Lee's mother. Perhaps the most intriguing aspects of “From Cradle to Stage” are the perceptions about parenting during situations that might challenge common norms. Having the courage and patience to support their child's dream, even when traditional instincts told them otherwise, was something each mother faced. Sandi Clark, mother of Gary Clark, Jr., had to deal with this. “She had to constantly remind herself that this was what he so passionately wanted to do—even though her mother’s instinct thought he should be doing his homework and getting ready for bed,” related Virginia Grohl.